I’ve been very intrigued with the Colorpop line so I recently put in an order for some lip products. I’ve watched a few youtubers rave about their lip glosses and thought I would start there. 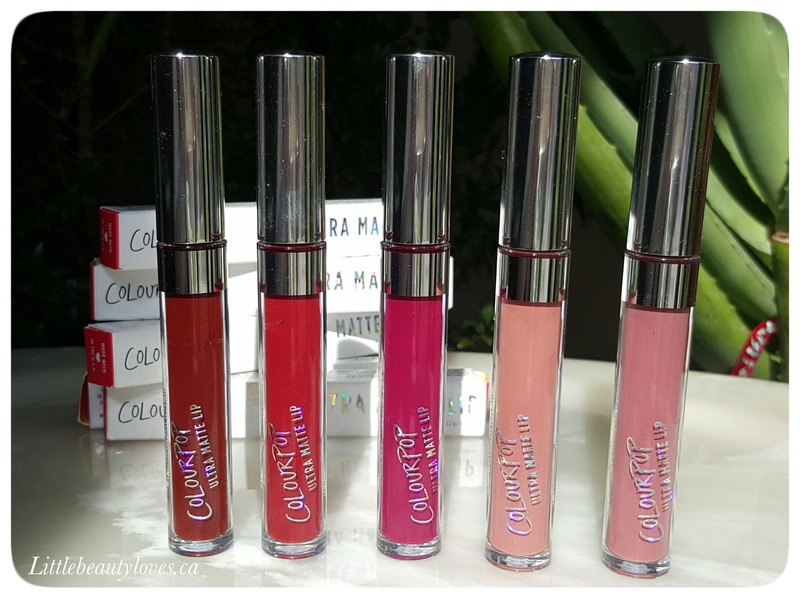 Colorpop is a brand that strives to bring every colour imaginable for the lips, eyes and cheeks at affordable prices without compromising quality. The cost of the ultra matte lip glosses were $6.00 US which is $8.10 CAD at our current conversion rate. Shipping was calculated by weight, so I ended up paying about $12.00 to Canada. All together my cost was $52.50 CAD for 5 lip glosses. 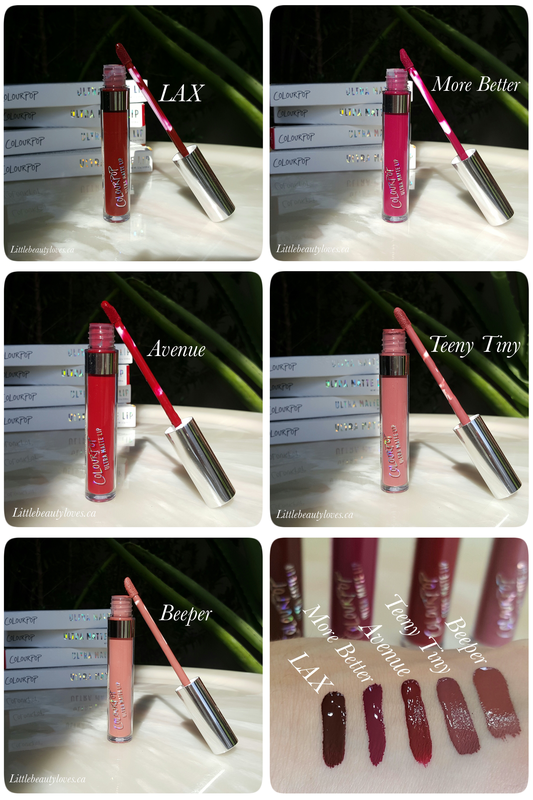 So, what do I think of these lip glosses? Well right off the bat the colours are incredibly intense. Colorpop is not kidding around, these colours are super pigmented! Also, they are truly matte! These have absolutely no sheen so if that’s what you are going for, you are really going to love these colours and the formula. The range of colours is quite impressive too. There are hundreds to choose from and I appreciate that each one has a swatch of the lips and arms of models so you can see how these look on, and if you’re still not sure, almost every single colour has a review posted so you can get the honest opinion of other users, and yeah, most of them are positive. One thing I would suggest is to exfoliate your lips. Due to the fact that these dry matte, they will excentuate any crack or peel on your lips. You also need to wear a lip primer beforehand, and it might even be wise to wear a lip liner to prevent feathering. Once these go on, they dry really quick and are pretty much transfer proof. The colour is true and long lasting so you don’t have to worry about it wearing off after an hour or two, which is really good because re-application needs to be done ver carefully. My overall impression is very positive, I like the way these come on and stay on the lips. They are very comfortable to wear all day. For the price, it’s a really good buy, even with the dollar conversion and shipping to Canada. Colorpop also had some other different lip finishes which I may try. I’m really curious about their eyeshadow line which I’ve heard a lot about as well. Have you tried the Colorpop line? What’s your favourite item(s)? You would love these! Super bold and beautiful just like you!!! Avenue is so gorgeous. I do notice transfer, but they feel good on and last right up until you eat something you shouldn’t. I haven’t tried any ColourPop but I’ve love to give their eye and cheek products a try! Teeny Tiny and Beeper look like my kind of shades! Hmm with the conversion and the shipping, it really does inflate the prices of the products, doesn’t it? Their eye products is what I’m looking for next. It’s honestly too bad with prices when you take into consideration that a lot of drug store products are the same price, these perform pretty well so I think it’s worth it. Not to say that it’s not bummy that our dollar is so low. Yeah… it’s been a deterrent to me ordering both ColourPop and MakeupGeek stuff for now! Agreed! They are surprisingly great lip colours- super matte but really comfortable to wear. Thanks for reading!